About the bookWouldn’t it be great never to have to work again? That’s what it’s like when you’re doing something you love – it isn’t work, it’s fun. Change your business, your job or your life by going on your own magnificent bear hunt.Bear Hunt's eight simple yet powerful principles can set you on your way....small things can make a big difference. 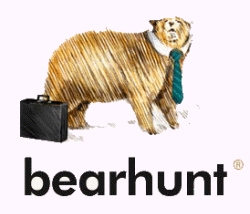 About the AuthorMalcolm McClean founded Bearhunt at the turn of The Millenium with the basic premise of doing ‘Great Things with Great People’. That is what he does and that is how he makes his living.....why don't you? To order a copy of Bear Hunt – Earn your living by doing what you love by Malcolm McClean click here.